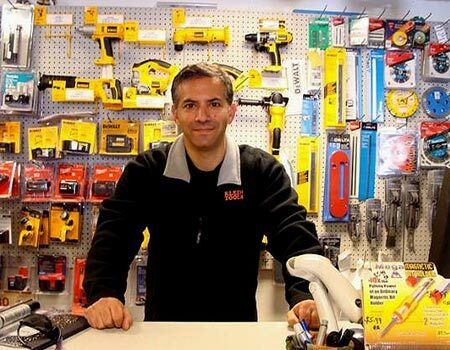 Tool Factory Outlet is a full service retail tool business in Orange County NY offering the best selection and pricing on power tools, hand tools, tool accessories, and hard to find specialty tools in the Hudson Valley. Arthur and Hannah Schindler opened Tool Factory Outlet nearly 35 years ago, and their son Barton joined the family business over 20 years ago. Today Barton and Hannah run our New York State Registered Woman Owned Business with the expert help of Troy and Jerry. Troy began working at the store at the age of 14, riding his bike to work each day. 25 years later Troy is still here offering a impressive knowledge of tools and accessories. Our new kid on the block, Jerry, has been with us for over 10 years. This type of longevity brings a level of expertise and customer service that is very hard to come by. We take great pride in supplying contractors, builders, woodworkers, electricians, plumbers, mechanics, homeowners and do-it-yourselfers with the right tool for the job at the right price as well. We are not a big box store. We are not a foreign owned and operated business with off-shore customer service. We are a family owned, family operated business that's proud to be part of our community. We encourage you to visit our store and rediscover what it's like to shop where personal service, quality products, and affordable pricing are business as usual, 7 days a week!